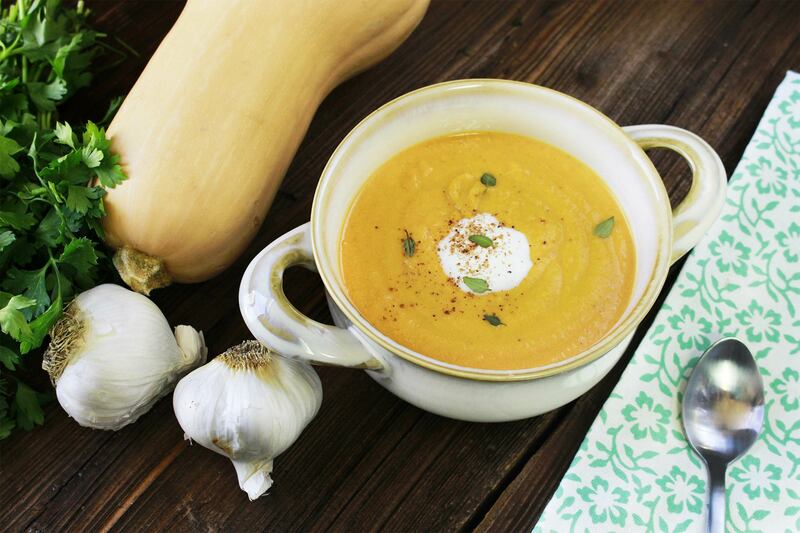 Named after our farm's delicious Nantes carrots, this flavorful soup personifies the flavors of fall that we crave. This recipe produces a wonderful, rich and silky soup that will have your family asking for seconds. Paired with a loaf of rustic bread and an apple, walnut and blue cheese salad, this simple soup is transformed into a stunning meal. Cut butternut into 1-inch chunks. Cut carrots into similar sized pieces. In a large pot, heat the olive oil. Add the onion (or shallots) and cook until translucent, about 8 minutes. Next, add the garlic and stir. Add wine and reduce the liquid slightly, cook about 5 minutes. Add the butternut, carrots and stock. Bring to a simmer and cook until tender, about 15 to 20 minutes. Remove butternut and carrot with a slotted spoon and place in a blender or food processor and purée. Add broth to make soup as thick or thin as you prefer. Return the blended butternut and carrots to the pot and simmer with bay leaf and fresh herbs. Add maple syrup and stir. Remove bay leaf and season with cinnamon, nutmeg, salt and pepper. Add yogurt and stir until blended.